The report prepared by the Economic Research Services (ERS) arm of the USDA, states, “We are not characterizing them (GMO crops) as bad or good. We are just providing information.” That ‘information’ is mounting, and it looks as if even US government agencies can no longer ignore it. This report, released online February 20th, comes at a pivotal time in the genetically modified crop debate. Mandatory labeling would force corporations who ruin our food supply to be liable for the damage they cause. But even beyond legal and monetary liability- can you really replace millions of butterflies, or repopulate bee colonies? Can you undo the cross-pollination of organic crops once they’ve been polluted with GM seed? Or can we undo the bodily damage we’ve induced on animals and ourselves? Weeds are becoming more resistant, not less, creating super weeds, and insects are following the same pattern – becoming super-mutated super-bugs. Biotech’s tactic of trying to kill everything is coming back to haunt us like a bad sci-fi blockbuster. Our over-sterilization of Mother Nature is causing the ‘pests’ to become worse. There are deep ramifications for allowing this juggernaut to keep crushing our voices, and ruining our planet. Fortunately, the collective cries for food justice have forced authorities to look more closely at GM, Big Ag, and Biotech. If you ask the right questions, you can get the right answers. If you ask nothing at all – well – you just stay ignorant and uniformed. At least the new USDA report admits genetically modified crops should be examined more closely. It seems that the scientific reports proving GM crops are linked to increased disease and illness are helping. “All our Environment, Health and Safety activities are driven by the `Vision of Zero’–no harm to the environment, to our people or to anyone we touch in the value chain. Why? Because it is the only acceptable objective.” –The Dow Global Public Report, 2001. Since the mid-1990s, through Monsanto’s propaganda campaign to farmers promising higher yields and insect-resistant crops, RoundUp Ready soybeans, corn, cotton, canola, and other crops have been sewn across our nation. “. . .in fact the yields of herbicide-tolerant or insect-resistant seeds may be occasionally lower than the yields of conventional varieties.” Many researchers have found no difference between the yield from a GMO herbicide tolerant farm and an organic one. Some researchers have even proven that organic farms are not only higher yielding, but also more bio-diverse and less environmentally damaging. The report also states that while insecticide use is down, herbicide use is through the roof. Our over-reliance on Monsanto’s favorite poison – glyphosate, has actually caused us to become dependent upon them for any ‘food,’ though it shouldn’t be called that in the least. It makes crop production harder, not easier, and much more expensive. Along with causing monetary insolvency, it causes absolute havoc on our ecosystem. We now have 14 different weed species that are supposedly ‘glyphosate resistant,’ but what of all the super weeds that are still becoming apparent? I guess quadrupling our herbicide use from 100 million to over 400 million pounds annually isn’t helping – it is only making problems worse. 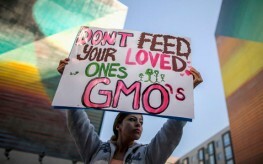 The ERS reports thousands of possible new strains of GMO crops. Tests are already under way for: 7,800 approved releases for genetically engineered (GE) corn, more than 2,200 for GE soybeans, more than 1,100 for GE cotton, and about 900 for GE potatoes. Of those releases, 6772 were for GE varieties with herbicide tolerance, 4,809 for insect resistance, and 4,896 for product quality such as flavor or nutrition, and 5,190 for drought resistance. Monsanto has the most authorized field releases with 6,782, followed by DuPont Pioneer, with 1,405. What the report failed to say is that this obvious disregard for public health and environmental vigor will be stopped. It is you who has forced the USDA, FDA and Grocery Manufacturer’s Association to step up their game. Don’t stop. We will succeed if we stand and win together. USDA won’t say it (typical coward shills in suits) but I will. GMO’s are bad and anyone who supports them, uses them, creates them, or distributes them are also bad and shouldn’t exist.